After hiking with friends in May, I realized that I needed to get my ankle checked. One of my goals is to walk the Camino de Santiago in Spain. After a few days of hiking in the Blue Mountains, I realized that my ankle wouldn’t hold up to walking stretches of over 10 miles a day for several weeks. If I was wimping out, the solution would be to train harder to acquire the necessary stamina.Was there an easily correctable issue? My first step was to embark on another kind of pilgrimage: navigating the medical system to get a professional opinion about my joints. The medical specialty process is an endurance test of its own—primary care appointment to obtain referral, x-rays; appointment with the orthopedist; MRI; and follow-up to assess alternatives. With living in northern Virginia and getting care on the northern side of the beltway at Walter Reed National Military Medical Center, travel was a complicating factor. The distance was too far to bike and driving on DC roads always has a potential delay factor followed by parking uncertainty. I opted to take the Metro (which is not without its own special set of glitches as I found in January), so travel time added to my treks. Consulting a surgeon often brings a bias for OR action. However after reading the MRI, the orthopedist determined that scoping to clear out particulate fragments was not an option. He explained that I have limited ankle joint and ultimately, would need the ankle fused or replaced. But he had an interim solution. Walter Reed is on the vanguard of prosthetic advancements and he recommended trying IDEO braces. IDEO™ (Intrepid Dynamic Exoskeletal Orthosis) is a rigid device molded out of black carbon fiber with metal struts. 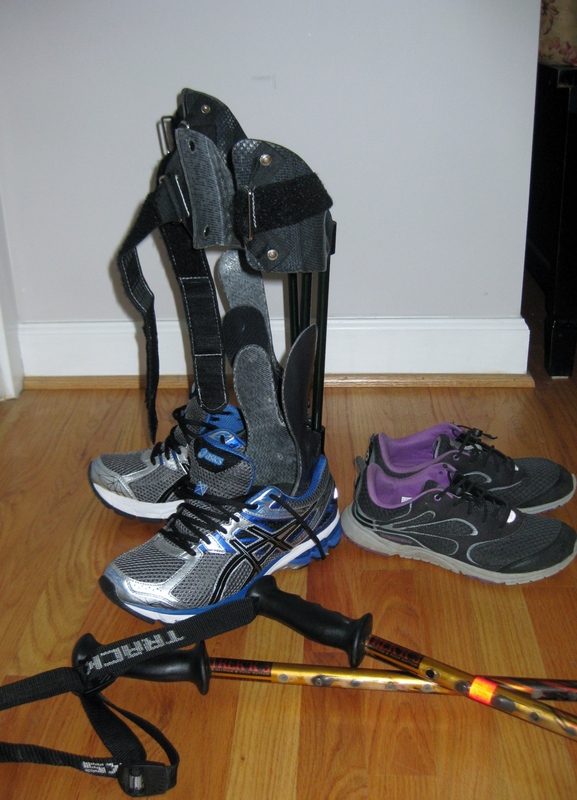 These braces help with lower extremity functionality for people with nerve and muscle loss. They bypass ankles to provide stability and pain relief. Given my spinal cord injury and after observing my friend’s experiences with a failed ankle replacement then amputation, joint replacement was not an option for me. Fusion is also an irreversible decision and I am not ready for that road yet. A visit to the prosthesis clinic at Walter Reed reminds me of how good I have it with four functional limbs. Jeff Fay has guided me through the multi-step process for braces: visits for leg casting and fitting with plastic testers before receiving the actual braces. Jeff saws trimlines to prevent blistering and modifies the cant of the struts with a wrench; thankfully not while I’m wearing the braces. Have you ever stopped to think how easy we have it to walk without donning a prosthetic leg or two? Learning something new is hard work. You’re not sure if the costs of time, energy, and looking inept will outweigh the potential benefits. After having the braces for a month, I am still adjusting to wearing devices that are like downhill ski boots without hinges. Walking in them requires a rocking motion and trusting that my toes will not catch and leave me flat on my face. The rhyme, Step on a crack, break your mother’s back, runs through my mind during my IDEO adventures. While I have never walked in stilts, that’s my brace-enhanced gait. Navigating flat ground is relatively simple, but uphill, downhill and steps are challenging terrain. And guess what? There aren’t many places that are absolutely flat, so for balance, I need hiking poles. Walking with the braces is comparable to weight lifting–good exercise on a limited basis–but not suitable for driving or even flying. But I am luckier than others I see at the clinic. At the end of my IDEO-wearing sessions, I can remove the braces and still have ankles that work, even if not pain-free. Unlike my co-blogger, I am not Running in High Heels™ or even running at all, but my IDEO experience reminds me to never take the ability to walk for granted. Walking is its own kind of miracle and lurching with IDEO has given me a cross-training alternative to limping. And maybe one day, I’ll return to running with my high-tech braces.